I still remeber my confusion and awe upon seeing fresh figs for the very first time, over 20 years ago in Santa Marinella, Italy, when our landlord brought my family a bowl of sweet dark beauties. 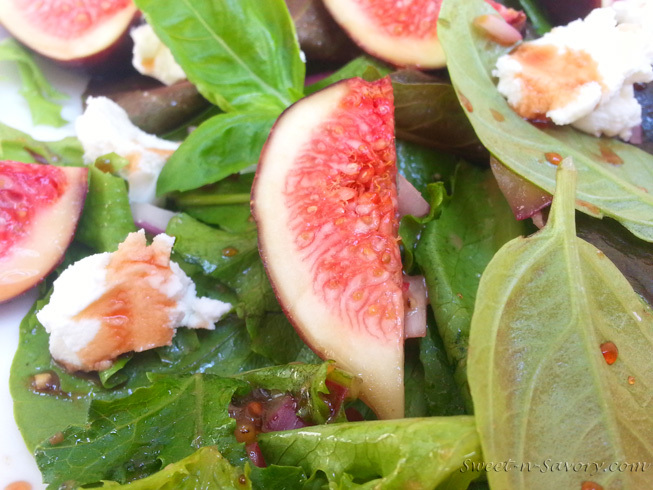 I never had figs before and when I tried them – I fell in love. The next day I realized, that fig trees, heavy with ripe fruit, were lining the street leading to the beach, and for the next two weeks me and my little sister haven’t had a formal breakfast or lunch – we munched on figs on the way to and from the beach. Forward 24 years, I was flipping the book “Plenty” by Yotam Ottolenghi and as I was admiring a fig salad with goat cheese and pomegranate molasses, a neighbour brought me a bowl of beautiful fresh figs from his tree, I also had some goat cheese left over from a goat cheese and zucchini fritatta I made for breakfast, and I always have Pomegranate molasses in my pantry, but I mostly use them as a condiment to fatty fish or lamb, it never occured to me to use them in a simple vinaigrette. The stars lined up, and it was fated that I make this salad, and boy am I glad I did! 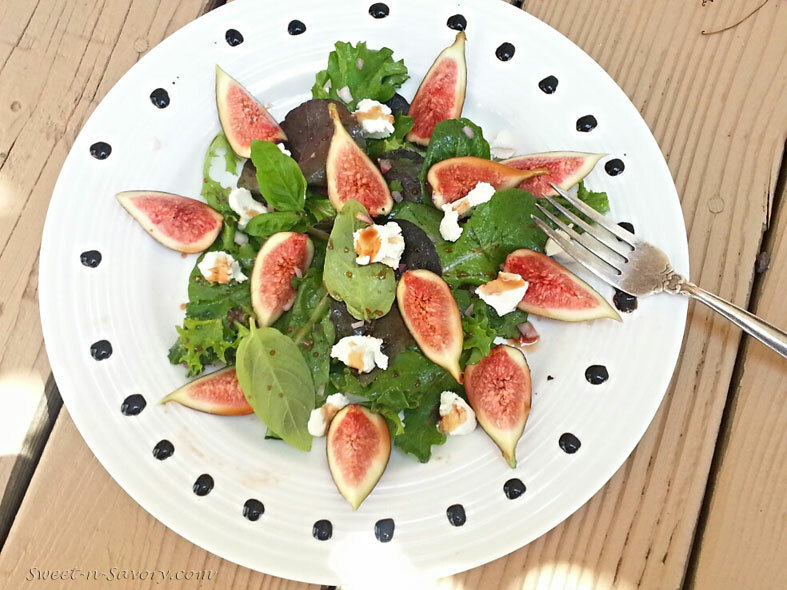 Its delicious and compliments the sweetness of figs and the richness of goat cheese perfectly. * Pomegranate Molasses(Narsharab is another name) are a thick, tart and sweet syrup made from pomegranate juice, and can be found in Russian, Turkish or Arabic grocery stores or on Amazon.com. 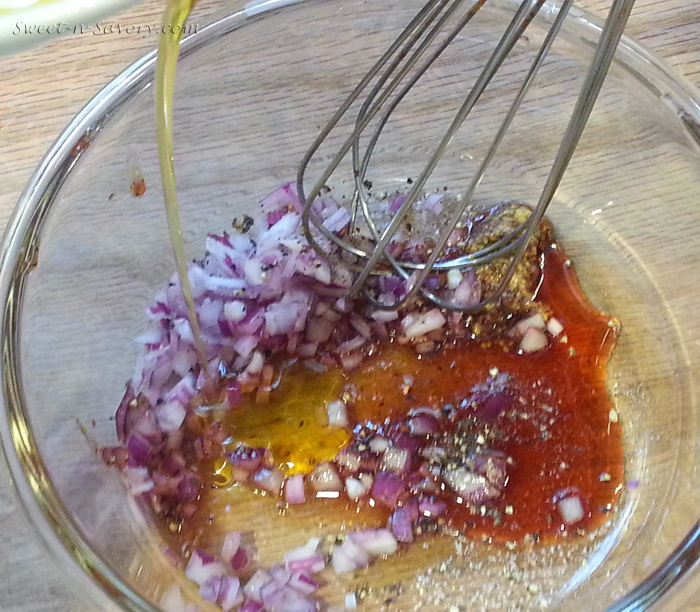 Place shallot, molasses, mustard and juice or water into a bowl and whisk. While whisking slowly add olive oil in a thin stream. 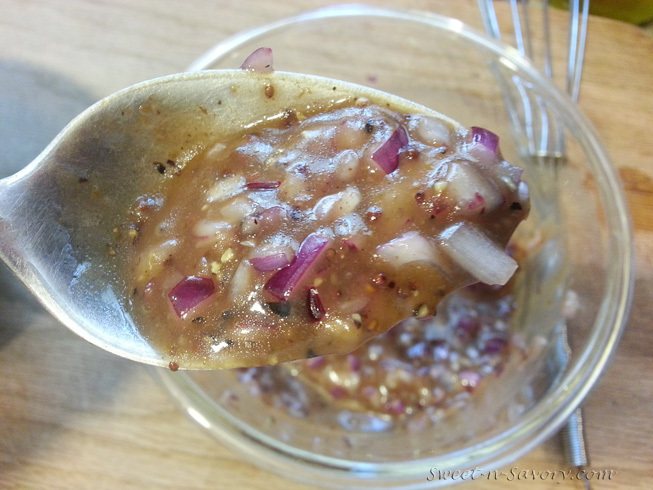 The vinaigrette will emulsify and look creamy.